Found in the bow of the vessel, this armoury of beautiful battleaxes is now on display in the National Museum of Ireland. 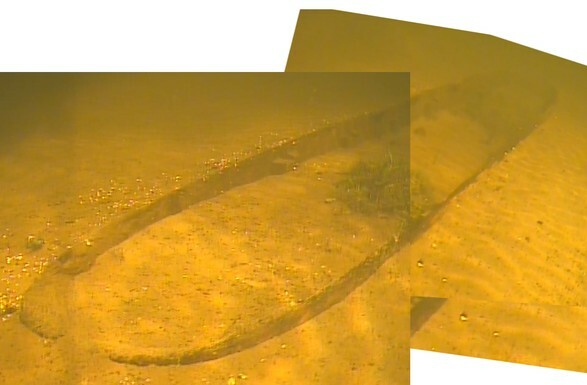 This is a mosaic of the boat in which the Carrowmoreknock Axes were found. The seats have been removed for conservation enabling you to see clearly the supports for the thwarts (seats) and the remaining rowlocks. The boat was designed to be rowed by 4 people, with one passenger in the stern. It can only be imagined what speeds this vessel would be capable of with four oarsmen pulling hard, but I'd imagine it would be one of the fastest vessels of its day. This would look wonderful as an exhibit in the Galway Museum together with the artifacts found within it, lets just hope that something can be put together to enable everyone to see this remarkable vessel. Well....you have to don't you ? Its not every day that something like this happens. They were quickly photographed before being put back into their safe transit containers. 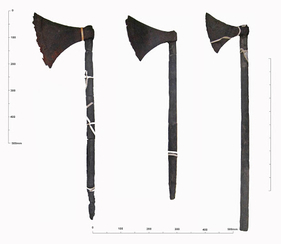 The cherrywood handles of the axes were found inside the wreck as well, and were reunited with their axeheads during the conservation process. AnglingCharts. 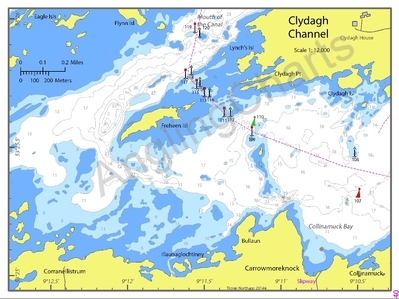 Wallcharts, GPS Charts and iPad/iPhone charts of Lough Corrib for fishing and cruising.